The 2018 Tonga Lush collection features fourteen fabrics in a palette of creams shading to soft blush, rose into burgundy, and vivid greens all nested in a navy-blue base. 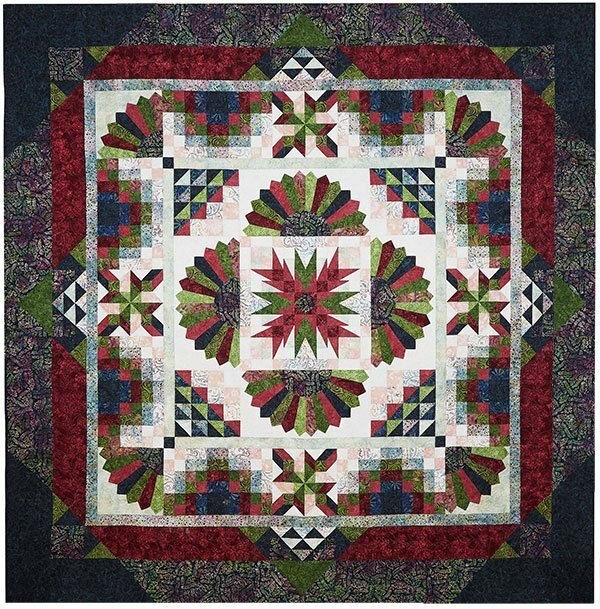 The Lush Block-of-the-Month quilt, 108” square, was designed to showcase this beautiful collection. The Dresden blocks are made with curved pieced handles and fnished points for simple appliqué by machine or hand. The blooming center block points are easily made with Creative Grids ruler or the paper templates included with the pattern. Throughout the quilt the classically pieced blocks are enhanced by unique color placement. This BOM will begin in August 2018 and run for 10 months at a cost of $ 29.99 per month. Kits will include patterns and all fabrics needed to complete the top and binding. RQ BOM kits contain the fabrics in the original pattern unless otherwise stated. The finished quilt is approximately 108" x 108".